Mulally: “We're still seeing economic expansion." 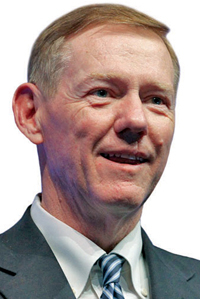 BANGKOK -- Ford Motor Co. CEO Alan Mulally said the automaker plans to add 7,000 jobs over the next two years in the United States -- a target set early this year -- as it expects the world's largest economy to avoid another recession. Ford is discussing adding as many as 10,000 jobs in the U.S. in negotiations with the United Auto Workers (UAW) union on a new four-year contract, according to three people familiar with the talks. Mulally, who was in Thailand Thursday, declined to comment on the progress of discussions with the UAW. In January, Ford said it would add the 7,000 jobs in 2011 and 2012. According to its 2010 annual report, there were 75,000 employees at Ford North America. The discussion about creating 10,000 jobs is part of high-level negotiations between Ford and UAW President Bob King over wages, benefits, and employment gains in the new contract and is still subject to change, said the people, who asked not to be identified revealing internal deliberations. Another source with knowledge of the talks told Automotive News on Wednesday that the 10,000 jobs figure was "not accurate." The U.S. automaker's plan to recruit more workers comes as President Barack Obama seeks to rally support for his $447 billion proposal to boost hiring. With U.S. unemployment stuck at 9.1 percent last month and the economy growing at a 1.3 percent annual rate in the second quarter, jobs will be a central issue as Obama campaigns for re-election in 2012. "We're still seeing economic expansion," Mulally said. "It is relatively less than we've had following previous recessions. But clearly the recession we went through is the worst that we've had since the Depression, so we're very encouraged by the recovery." Mulally was in Thailand to attend the production debut of Ford's Ranger pickup truck at a local plant. While growth in Europe has slowed due to the region's debt crisis, expansion in the Asia-Pacific region remains "substantial," Mulally said. Increasing Ford's business in Asia is part of the CEO's wider plan to boost annual global sales 50 percent to 8 million vehicles by 2015. Ford's U.S. market share rose to 16.8 percent this year through August from 16.7 percent last year, according to researcher Autodata Corp. Under Mulally, the carmaker has been diversifying its model lineup, including adding the Fiesta subcompact. "The U.S. industry has been through its worst, and Ford is optimistic about the auto market's recovery," said Ashvin Chotai, London-based managing director for Intelligence Automotive Asia. "Ford's financial situation is very good, with the restructuring and partial recovery. The hiring plan seems flexible and realistic, too." Ford earned $9.28 billion in the past two years after $30.1 billion in losses from 2006 through 2008. The automaker borrowed $23.4 billion in late 2006, putting up all major assets including its blue oval logo as collateral. That helped Ford avoid bankruptcy and boost U.S. market share the last two years. Ford, Toyota Motor Corp. and General Motors Co. are among automakers using Thailand as a global production hub due to tax incentives and trade arrangements that grant access to Southeast Asia's 592 million consumers. Ford has invested $1.3 billion in Thailand in the past three years. The carmaker signed a 15.5 billion-baht ($497 million) loan agreement in July with three Thai banks to fund a new passenger car manufacturing plant in the eastern province of Rayong.